Chinese Performing Arts of America–CPAA–invited The Lively Foundation to present a dance in the 1st Silicon Valley Arts Showcase, July 26, 2-3:30 p.m., at CPAA’s International Performing Arts Center, 6148 Bollinger Road, San Jose. It is an honor and very exciting to be included. Four beautiful dancers will perform Face to Face, a dance choreographed by Leslie Friedman for the Adagio for English Horn & Strings by Mozart. 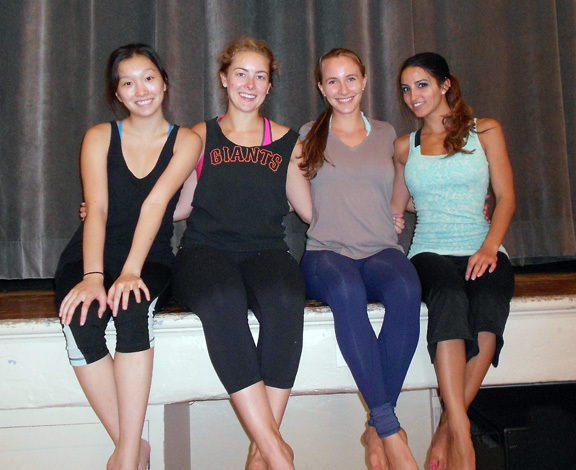 A wonderful group of dancers has been rehearsing the dance every day; now, the performance is about to begin! The program will include both Chinese and Western music and dance. At the same site, there is also an exhibition of painting and calligraphy which opens July 25. Pictures: In rehearsal at the Mountain View Masonic Center, Mountain View, CA, onstage, L to R: Natalie Duong, Katy Walter, Laila Waheed, Leelianna Fezli; standing, L to R: Leelianna Fezli, Laila Waheed, Natalie Duong, Katy Walter. 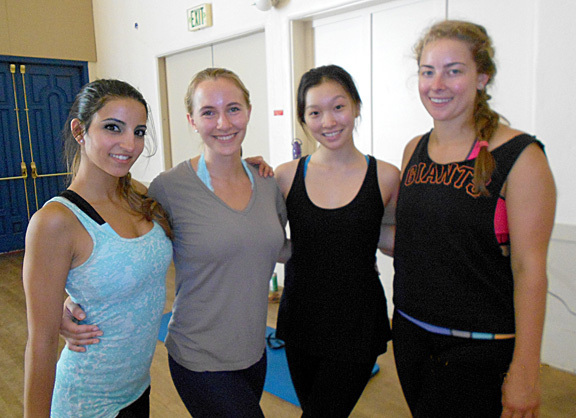 This entry was posted in Lively Foundation News & Events and tagged 1st Silicon Valley Arts Showcase, Chinese Performing Arts of America, CPAA, Katy Walter, Laila Waheed, Leelianna Fezli, Natalie Duong, San Jose on July 24, 2015 by Leslie. Here it is: the class schedule for your most wonderful dancing week. Please note: (1) there are differences day to day, especially MWF schedules compared to Tues & Thursday, and (2) there are two venues, our Headquarters at the Mountain View Masonic Center, and the nearby Pacific Ballet Academy, 1095 Wright Ave., Mountain View. This entry was posted in INTERNATIONAL DANCE FESTIVAL-SILICON VALLEY and tagged Classical Chinese dance, Contemporary Dance, Dunham Technique, international dance festival@silicon valley, Mountain View Masonic Center, Pacific Ballet Academy, salsa, The Lively Foundation on July 10, 2015 by Leslie.